There are times when I am inspired to write. And then… Well, it’s like pulling teeth. If you are somewhat familiar with the music of Benin – formerly known as Dahomey, you should own a copy of Analog Africa‘s African Scream Contest (If not, stop what you are doing, run – don’t walk – to your local record store and purchase it. Right now. Go on. Get.). Besides the closing track “Oya Ka Jojo”, you will find an interview with Atchadé Joseph in the extensive liner notes. For further information, as well as a number of great tracks, head over to ORO (Here, here, here, here, here and here.). Catalog number VG EP 0007 on Les Volcans. Released 1977. What you have is very similar to toasting, which started in Jamaica as early as the 1950s. But, to the best of my knowledge, toasting was done live in the dance halls – and not in the recording studios. I also seriously doubt that H. C. Clementophe was listening to Gil Scott-Heron – who was using a live band… So how did some one in Africa – presumably in the 1970s – pick up on this? I have to admit, I am a bit suspicious as to the origins of this particular record… I have never seen another record on this label, and there is no indication as to when it was released. If you have any information, please drop me a line or leave a comment. 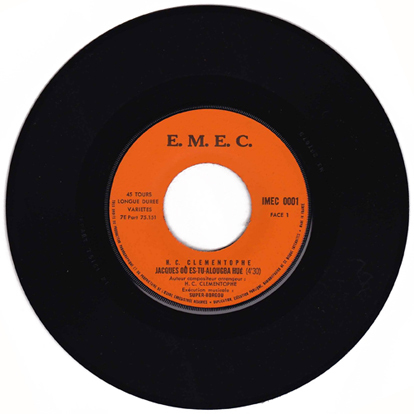 Catalog number IMEC 0001 on E. M. E. C., manufactured in France. I don’t have too much to say about this one. Luckily, the record more than speaks for itself. If you have any further information about Ferry Djimmy or his backing band the Dji-kins, please contact me or leave a comment. Catalog number 2 C 006 – 15173 W on EMI / Pathé, pressed in France. No release date listed. “The history of modern music in Parakou is directly connected to my father. In the 40s my dad traveled to Accra to become a goldsmith but he returned to the Borgou with something even more important – modern music. In Ghana my father fell in love with Highlife music and studied it intensively after work. When he arrived here he formed the first modern musical group of Northern Benin; it was called L’Orchestre Sinpam. When the adolescents of the region heard about it, many of them came to Parakou asking if they could get a musical education. So we had people staying here for few weeks, sometimes months, getting lessons from my dad, who was known in the area as “Mousse President”. Many of them returned to their villages to form their own bands. That’s how modern music started here in the Borgou. My older sister was the first of our family to take advantage of those classes. She learned how to play the flute and later became one of the most popular singers in northern Benin. Her name was Leha Nato. She was a rebel and the first woman in Parakou to wear trousers, and despite being a Moslem, my father encouraged this attitude. He wanted to modernize the behavior and the thinking of the people. I was born in 1947; I don’t know the exact date but it was on a Friday, which is why people know me as Moussa “Djima” (Djima is Arabic for Friday). I grew up just watching all those musical things happening around me and I could literally feel music entering my soul. In my early teens, electric guitars started to appear in Parakou, especially during festivities: weddings, circumcision rituals, etc. The first guitarist to perform at our house was Waidy, my brother discovered him in Togo. He would entertain the folks for the whole period of Ramadan, Waidy would sleep end eat at our house, end I watched him practice every day. Then we found another guitarist in Ouidah named Aaron; he was cheaper. We did that for few years until around ’62-63. Throughout those years I never took lessons; I just watched those guys play and tried to copy them on a guitar I built using fishing line and some other tools. In ’63 for some reason we didn’t manage to find a musician to entertain the town, and Ramadan was approaching rapidly. The elders were panicking. I told them not to worry – I would play. They wondered, “When did you learn to play?”, “I will play!” I replied. On the first evening of Ramadan it happened. I performed using just two strings. The next morning people came to see my father to ask him if I was a genius or possessed by evil spirits. Soon youngsters started knocking on my door asking for guitar lessons. They would stay here for two, sometimes three months. We would discuss the price for accommodation, food and beverage. Most of my students used to pay with rice or meat; the ones who had money would pay 50.000 CFA for one month and 100.000 CFA for three months. That’s how I used to earn my living. My first band at that time was named Alafia Jazz. We covered Rumba songs by Franco – that’s where I got the artist name Mama Franco from. I changed the name of the band to OK Jazz later in ’64. A few years later we started to develop our own musical identity based on traditional rhythms and songs from the region. At some point I started thinking, We are the best band from northern Benin singing in Dindi and Bareba, but we have a Congolese name – not good! I decided to choose a name that would show our origins, so we renamed the band Super Borgou de Parakou. Ousman Amoussa handled backing vocal and gon, Sidi Alassane was on the toumba and kit drum, Sidi Seidou played traditional percussions, Soulaima Karim sang lead, Mama Biogado played the bass, Menou Roch was our rhythm guitarist and I was on lead guitar and vocals. We started touring Niger in ’69. We found a job at a bar called Congolaise; the owner was a former Guinean military man who disagreed with the politics of Sékou Touré and had fled the country with his Vietnamese wife. They were a very sweet couple, so we dedicated this song to them. All the money we managed to earn working in Niamey was invested into better equipment, amps, guitars and other stuff. One day I remember entering a music shop to buy a flute back in ’71 when I heard someone playing an instrument I had never even seen before. The sound was absolutely gorgeous. I asked the seller what kind of instrument that is, to which he replied, “It’s an organ“. I asked for the price. He told me 140.000 CFA. We had saved 300.000 CFA, so I bought that organ on the spot. That was on a Monday; by Saturday I played the whole set using it. It took me a day or two to understand it, but it wasn’t really a problem. On the third or so day I used our new acquisition to compose a hugely successful Afrobeat song called Da Doga Bouyo Inin Be. The first musical competition we did was in ’72 in Cotonou. At that time the government would choose one band from each state. Poly-Rythmo, Echos du Zou and many others were all competing. We won and consequently were invited to the International Music Festival in Berlin, Germany“. Catalog number ASB175 on Albarika Store of Lagos, Nigeria. No release date listed. In Benin, records must grow on trees. For such a small country, there seems to be hundreds of records from there – and most of them are really good. There were loads of small labels both in Benin and in neighboring Nigeria. And in 1973, the Societé Africaine de Techniques Electroniques – or SATEL – pressing plant opened it’s doors on the highway between Cotonou and Porto Novo, which became one of the most popular pressing plans in all of Western Africa. One of those labels was Albarika Store, which was also then name of a chain of record stores, was ran by Seidou Adissa. Samy Ben Redjeb interviewed Celestin Houenou Seza, who was Adissa’s right hand man, for the liner notes of the African Scream Contest compilation on Analog Africa. I was giving lessons to Adissa’s children during holidays and I guess I made a good impression on him because as soon as I finished school in 1969 he asked me to help him to manage his new project. He loved traditional music from his tribe, the Yoruba and he wanted to produce a few artists and see if he could make a business out of it. The first artist recorded was Yedenou Adjahaoi, who was the most popular traditional artist in the region. 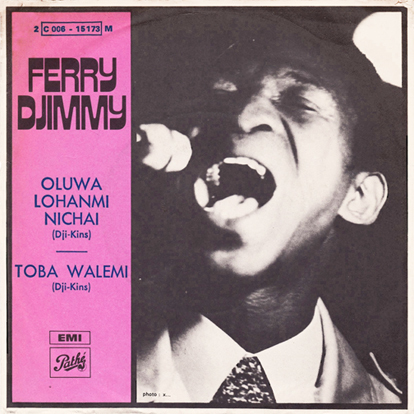 His first single was recorded in Nigeria and distributed by Badejo in 1968. That record was a hit. As a consequence Adissa came to see me and offered me a chance to join his music company. I had just finished school and was a seventeen-year-old boy full of ambition and he was a great businessman who couldn’t read or write. He showed me the whole procedure – from the recording to the pressing plants via the distribution network, and by the time we did our first modern recording. which was by Gnonnas Pedro, I knew how to run the whole label by myself. In 1969 the students from the University of Porto Novo were going crazy for a track from Ghana called Sock It to Me (by The Super Eagles) and they were bombarding us with requests. We never experienced that kind of reaction so we were wondering what kind of song could that be? So I traveled to Accra to buy a small stock of that record which we would resell in Dahomey. I purchased about a hundred 45s, and in two days they were all gone. We didn’t want to go back to Accra to get some more. Instead, we thought of recording our own version for the Benin market. El Rego had a guy called Eddy Black Power who could do that kind of stuff, so we approached him. We left for Lagos with El Rego et Ses Commandos where they recorded four songs We sold three thousand copies of the title Feeling You Got (the cover version of Sock It To Me) which was a huge success at the time, so we decided to look for the band members of the Super Eagles to buy a license. Despite many trips to Ghana we never managed to find them Then, one day we found out they were actually from Gambia! A few months later we signed Orchestre Poly-Rythmo. Adissa wanted the song Angelina, so we traveled to Lagos for a recording; that was in early 1970. Adissa hadn’t even noticed the other songs we recorded that day, but I felt something would happen with the track Gbeti Madjro. Man, it spread like wildfire. We sold a lot – not sure how many, but a lot. I believe that song revolutionized the music industry in this country. At that time we had decided not just to focus on bands from Porto Novo, or Cotonou, but also to travel all over the country to locate and record the best bands. I was in charge of those kinds of operations – I was actually in charge of everything, but that’s the part I am most proud of. I would travel to every corner of Benin looking for groups. In Parakou, which is located in the northeast of the country we bumped into an excellent band led by Alidou Boukari called Anassoua Jazz, Their first recording with us was a Jerk called Fatouma Na Alidou recorded in 1971. We had huge success in the Borgou state with that one, which encouraged other bands from the region to seek our production. One day I found (Moussa) Mama Franco in front of my door. He explained that he had a group called Super Borgou de Parakou, and that he wanted us to record them, Moussa seemed to be a serious guy with a positive attitude, so I traveled back with him, and found out that the band was having enormous success with its live performances. They had an incredible drum’ mar I forgot his name, and their lead singer had a golden voice; we used to call him “Saka”. It was with Super Borgou that we made our first extended play 7” inch record. Some of the bands we recorded over the years were rebels and I spent a lot of time checking the lyrics and censoring offensive words I had to make sure the songs could be played on the radio. When El Rego covered Sock It to Me, I changed the tide to Feeling You Got. Some of the groups we produced simply didn’t want us to touch to any of their lyrics, so we would just drop the title and get on with our business. But to release a song with naughty lyrics would have given us bad press, and my job as to make sure that didn’t happen. This interview is just about the only mention of Orchestre Anassoa Jazz de Parakou. The only other information that I have been able to find is that the main person behind the band was Alidou Boukari – who would later go on to form Orchestre Anos Band. Also, Orchestre Anassoa Jazz de Parakou released at least two other singles, both on the Albarika Store label. Catalog number ASB29 on Albarika Store of Lagos, Nigeria. No release date listed. I have always been amazed by the sheer volume of great records from Benin. For a country about the size of a postage stamp (actually 43,483 square miles – but small nonetheless), the country formerly known as Dahomey produced major bands like Orchestre Poly-Rythmo (who released somewhere around 150 records) as well as many lesser known bands that released one or two singles. Unlike Nigeria and Ghana, where Highlife was the most popular form of music, the music of Benin was much more raw. One of the best compilations to capture the sound of Benin, as well as neighboring Togo, is “African Scream Contest” on Analog Africa. In the liner notes, Samy Ben Redjeb explains how the musicians of the region integrated regional and foreign influences to produce a sound unlike anywhere else. Like most modern music in French-speaking West African countries, the music of Benin and Togo was influenced by a few main musical currents: Cuban, Congolese and local traditional music, as well as Chanson Francaise. Additionally, the geographical location Benin and Togo – sandwiched between Ghana and Nigeria – exposed Beninese and Togolese musicians to Highlife music. Benin’s two primary music importers – Afissoulai Lowani and Gbékin Hilaire, the founders of the labels Aux Ecoutes and Voix Africaine, respectively – were chiefly responsible for the development of the distribution channels for importing music into Benin, Highlife was imported from Accra and Lagos via the Philips and Decca record companies. Congolese rumba arrived from France via Khan (based in Marseille) and Sonodisc (based in Paris), as well as direct imports from Kinshasa and Brazzaville. Cuban records were imported from New York and Miami via distribution plants in Abidjan. 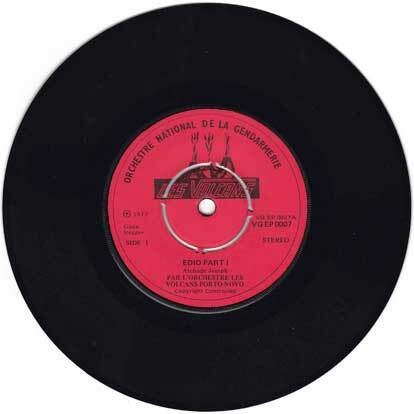 Chanson Francaise (especially Charles Aznavour and Johnny Halladay) was imported from France; French music was taught in schools and constantly played on national radio. The cultural and spiritual riches of traditional Beninese music had an immense impact on the sound of Benin’s modern music. Benin is the birth place of Vodun (or, as it is commonly known in the West, Voodoo) and some of the rhythms used during traditional rituals – Sakpata, Sato, Agbadja, Tchenkoumé and many others – were fused to Soul and Latin music on early as the mid-60s and Later to Funk. Vodun was formally recognized by the Government of Benin in February 1996, and Ouidah remains its epicenter Ouidah is also home to a large Brazilian community – or, as they are called in Benin – Agoudas. Members of that community are descendents of slaves who returned from Brazil at the end of the 19th Century. Their dances (such as Kaléta and Buriyanii) and songs are still being preformed and fused into Beninese rituals. That, too, can be heard in modern Beninese music. Performers such as Ignace De Souza and Charles Rodriguez are Agoudas. By 1968 a few labels – Albarika Store, Poly-Disco, Gretaissy and Aux Ecoutes – started recording local musicians using Nagra reel-to-reel recorders borrowed from the national radio station. The reels were then to Ghana, Nigeria, Belgium or France, where the matrices were manufactured and the vinyl pressed and released on such labels as Philips, Badejos Sound Studios, Songhoi, Riveria, etc. 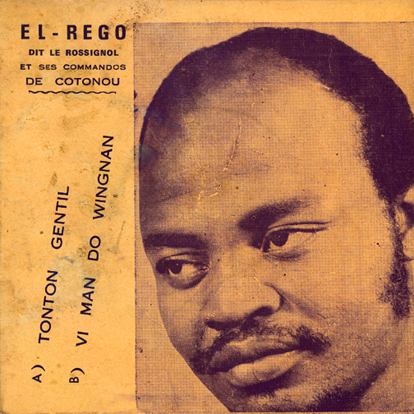 The first Benin artists who started recording were G. G. Vickey, Gnonnas Pedro, Picoby Band and Super Star de Ouidah, followed by El Rego, Sunny Blacks Band and Ignace De Souza. In the late 60s Funk and Afrobeat started creeping into the region. In particular, the music of James Brown became immensely popular with university students. That’s when the music scene in Benin really started to take off. Most, if not all of the groups, started fusing all the genres mentioned above into a very distinctive sound that can only be found in that country, and made Benin into an incredible music melting pot unequalled in Africa. Bands combined Latin with Soul, Sakpata with Funk, Sate with Afrobeat, Punk with Break Beat – you name it and they probably tried it! Other than the fact that Orchestre Black Dragons were from Porto-Novo, there is not a whole lot of information about them. They did release two other singles, both on the Albarika Store label. The song “E Sa F’Aiye” was included on the compilation “Off Track Vol 2 – Queens” which was put together by the crate diggers Kon & Amir. Catalog number ASB 85 on Albarika Store of Cotonou, Dahomey, pressed in Lagos, Nigeria. No release date listed. El Rego et Ses Commandos were from Dahomey, now know as Benin. I was born on May 3, 1938, in Porto Novo. My family is originally from Ouidah. After childhood in Benin I was taken to Dakar in 1945 by a wealthy friend of my father; a usual practice at that time. It was at the school Medina de Dakar in 1952 that me and some other foreigners from Togo and Benin started a school band, which we named La Jazz De Dakar. I was the harmonica player I was back in Benin in early 1953 At that time Abela music from Ghana and Asiko from Nigeria – both kinds of Highlife – had taken over our radio waves. I started looking for musicians to form a new band, which I called La Jazz Hot. G.G. Vickey, a student at that time, became my guitar player. At the end of 19531 left for Niamey in Niger. where I encountered a band called Los Cabanos. The lead singer was excellent, especially when performing rumba classics; and as is so often the case in Africa, he was soon pinched by a producer from Ivory Coast. I was a big fan of Franco; my favorite song was “Ele Wa Bolingo”. When the Cubanos guys heard me singing that tune they realized that they had found the perfect replacement. We had gigs in Ouagadougou all the time, so we were constantly shuttling between that town and Niamey. It didn’t take too much time before the government of Burkina Faso (haute Volta in those days) asked us to join forces with L’Orchestre Voltaique, which was the national orchestra. We used to jet-set between the countries of La Conseil de l’Entente, which was a kind of United States of Africa, comprising the Ivory Coast, Burkina Faso, Niger and Benin. I stayed with that formation for quite some time, eventually deciding to return to Cotonou in 1960. At that time the talk of the town fr, Dahomey (Republic of Benin today) was Los Panchos of Gnonnas Pedro and La Sondas of the Belair Hotel. I decided toy and soon bought some musical equipment, including an amazing Contra-Bass, an instrument I had learned to play in Niger. I formed Daho Jazz in 1962. We used to play at the Black & White Club, if I remember correctly. The owner wouldn’t let us tour; which was so important to promote the music, so I left the group and joined Gnonnas Pedro’s Los Panchos. Later in 1963, I formed another band, which I called the Jets. The Jets became Los Paras, in ‘64, then Los Commandos in ‘65, and finally El Rago at Sas Commandos in ‘66. That’s when things got really serious for us, and we decided to start touring all the neighbouring countries, inciuding Ghana. It was in Ghana that I made my first appearance on TV and more importantly, where I hired Eddy Black Power, a soul singer whom I saw performing some James Brown stuff in Accra. He would later sing on a track called – “Feeling You Got” – Albarika’s first major hit. Also, according to Frank Gossner of amazing Voodoo Funk blog, El Rego is still alive and well in Benin. Frank interviewed him for an upcoming documentary film called “Take Me Away Fast” by Leigh Iacobucci. Since the initial posting of this song, it has since been included on the Analog Africa “Legends of Benin” compilation from 2009, which also features Antoine Dougbé, Gnonnas Pedro and Honoré Anolonto. In 2011, Daptone Records released a compilation CD and LP of the best of El Rego’s tracks. Rolling Stone posted part of the interview from “Take Me Away Fast” for the promotion of the compilation. Catalog number L. A. 25 on Aux Ecoutes of Cotonou, Dahomey.